LED has developed quickly in recent years as cities promote highly energy efficient lighting, according to a Securities Times report. Among global LED lighting applications, household lighting and automotive LED lighting industries have been the fastest growing markets, and have become the main growth drivers in the LED industry. Additionally, LED market still holds great potential, and has been growing steadily. 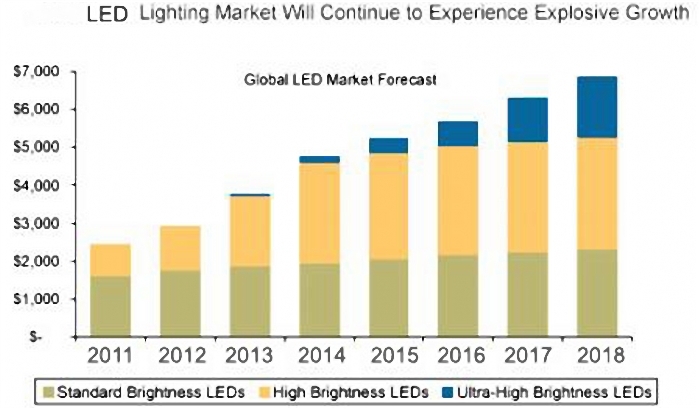 In the household lighting sector, experts estimate the global LED lighting market value will reach US $17.8 billion by 2014, while total LED lighting shipment volume is at 1.32 billion. Philips estimated the global LED lighting market value will reach between EUR 70 billion (US $90.55 billion) to EUR 80 billion, and acquire a 45 percent to 50 percent market share in the lighting industry by 2016. Accompanying technological developments, LED bulbs have evolved from offering simple lighting features to intelligent lighting devices. Besides using smart controls to turn on and off lights, smart lighting are also an interactive hub that can add value to the product to include fitness management, GPS, targeted advertisement in retail sectors and offer many other personal services. Last year, China ranked as the top global automotive sales country for the fifth consecutive year having sold more than 20 million vehicles. The countrys large automotive market encouraged developments in car components. Automotive LED lighting market had great growth that surpassed other related industries. Prior to 2010, the automotive LED lighting industry increased at an average rate of 13 percent annually, but since 2012 the growth rate has climbed above 40 percent. Since car LED lights are a cool light source (with low heat emission), energy consumption is about one tenth of conventional light source, hence making them more energy saving. Chinas Ministry of Industry and Information Technology (MIIT) aims automotive lights to reach its carbon emission target by late 2015. Since LED is a recognized environmental friendly light, if these lights are introduced into the automotive lighting market it will be worth billions of Chinese Yuan. The gross profit of LED lighting products is typically three to five times that of average LED products. Yet, this highly profitable market is being divided among international companies or Chinese companies with foreign investments. Few Chinese LED manufacturers have been able to venture into automotive LED lights market, due to technical limitations. In recent years, CN Light, which has core technology advantages and excellent product quality, has been able to acquire a leading position in the automotive HID lighting market. The companys advantages in this sector has given it an early lead in the automotive LED lighting market. Chinas LED display industry has developed very quickly since 1990, which also brought prosperity to the LED industry. Chinas LED display industry is still in the fast growth phase. China Optics and Optoelectronics Manufacturers Association (COEMA) projects Chinas LED display market value reached RMB 24.10 billion (US $3.93 billion) in 2013. High growth rates of 15 percent per year are expected to continue in the LED display industry in the next three to five years. Full-color LED display sector will have fastest annual growth rates of 30 percent per year. LED display applications is expected to become a stably growing industry in China.